Hand drummer questions source of wood used to make djembe drums. The premise of this article is to help facilitate an understanding of the manufacturing process in using environmentally prudent wood to produce djembe drums. 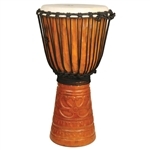 Purchasing djembe drums that are made from legally harvested, sustainable wood help to protect our world's forests, assist in preserving and maintaining a well-balanced eco-system and help support local economies. Our world is more connected than ever before. Modern technology has made the planet a smaller place through cutting edge advances such as e-mail, broadband, internet, fiber optics, and of course the iPhone. Along with these advances comes information - lots and lots of information. Just pull up your favorite web browser and type in 'Global Warming' and you'll see that Google has indexed roughly 72,400,000 web sites that contain those keywords. Type in 'Legal Wood' and you'll see an impressive 21,600,000 web sites found. And hey, it posted those results in just .07 seconds. Now, that's fast! However, even with all this speed and information, I was hard pressed to find any decent content on the kind of wood used in manufacturing traditionally based djembe drums. Not only that, but I couldn't tell which companies were using legal wood, the benefits of using legal wood, and the concerns with using wood that wasn't legal. The traditional djembe is made from wood. 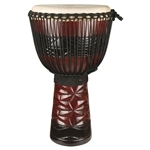 And many of the djembe drums that are available for purchase in this country are imported from Indonesia, Thailand, and Africa. In fact most of the African djembe drums sold in the U.S.A. are actually made in Indonesia where, according to Indonesian Department of Forestry, the deforestation rate since 1998 is estimated at 2.8 million hectares (7 million acres) per year. During the last 30 years, the world's tropical rainforests have shrunk by 25% around 12.3 million hectares of forest. Agriculture and the trade in tropical wood are the main causes of deforestation. Unfortunately, many companies (small and large) in this country still knowingly import wood that is neither sustainable nor legal. For instance, in an article posted by the Chicago Tribune, at a Lowe's annual meeting last May of 2006, a shareholder proposed that the company issue an annual report on progress toward its environmental pledges. The company's board of directors disagreed and unanimously recommended a vote against the proposal. Why? It's much more expensive to secure wood that is legal and sustainable than illegally harvested wood which can be acquired cheaply. Buying illegal wood helps corporations keep their expenses down and profits up, however in the meantime they're contributing to an unsound environmental policy that is both harmful and destructive. Legally Certified Timber – The Green Way! The good news is that there are many certifications and processes that are in place to properly protect our forests and yet still benefit from their bounty. The first is using legal wood. Simply stated, legal wood is felled and traded in accordance with the law. The producing country is obliged to ensure compliance and enforcement of the laws and rules. To be certain that wood is legal, its origin must be known and documented through every step in the wood trade process – from the felling of a tree to the sale of the wood in a shop. Sustainable wood is produced in a responsible way taking into account the environment, the economy and social circumstances. This means, for example, not felling more trees than the forest can afford to lose; planting new trees (reforestation); minimizing the damage caused to other trees and plants; safeguarding biological diversity (i.e. the range of animals, plants and microorganisms) and taking into account the impact on the soil, water, landscape and ecosystems. When shopping for a djembe drum it's important to know the source of the wood so you can make a more educated decision. 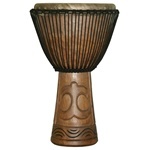 Purchasing djembe drums that are made from legally harvested, sustainable wood help protect our world's forests, assist in preserving and maintaining a well-balanced eco-system and help support local economies. Get the facts before buying and ask questions. It's your buying decision that helps shape the world in which we live. We only work with environmentally friendly suppliers that can prove a Government certification process. Our manufacturer in Indonesia uses government inspected legally harvested wood. We have a copy of their certificate from the Indonesian Government. It shows that the Indonesian government inspected the wood, was verified to be legal wood, and gives permission to move the wood from the area (Village) where it was cut to a different area (SKSHH) Name of certificate. In order to get this far in the certification process the Loggers or tree owners would need to have a (Ingin Tebang) License to cut the trees. This process is when the Government actually comes out to inspect the trees to be cut and certifies they are legal. One thing to point out is our suppliers name being on the certificate shows that they are the buyer and they are also the manufacturer. This makes it very easy to trace back to the Forestry department. Lastly, they are inspected every month by the Forestry department and are required to have every one of their SKSHH inspected and verified.